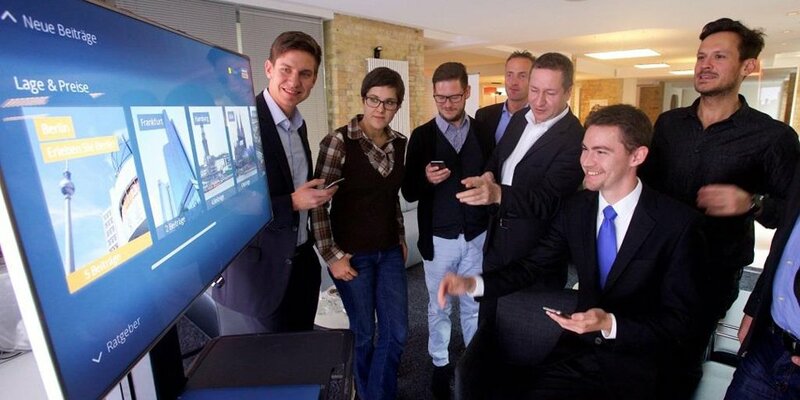 In cooperation with Fraunhofer FOKUS, ImmobilienScout24 developed and launched the world’s first Smart TV Application for real estates. The application enables a multimedia flat-hunting for Internet Television viewers from their TV armchair. Besides an aesthetic and high-quality source of inspiration all around the subject of flat-hunting, the Smart TV application provides the user with an extra comfort: you can search, share and find apartments across multiple devises and turn your home into a “digital living room”. If you have looked for flats during the day on your desktop or smartphone you can share your results in the evening with your whole family on your Smart TV. Only a few clicks are necessary to connect your tablet or smartphone with the app. Additional information will be automatically indicated on the Smart TV display which will improve your further search. For example, videos about the respective neighborhood or market data will be presented to you. At the same time it also works the other way around; by scanning a QR-code the user can look at apartments of specific neighborhoods on his smartphone. However, the app has considerably more to offer. The main focus lies on the aspect of “infotainment”. All contributions convey the content in an entertaining and informative manner, which is of high value for the user. The highlight of the Smart TV application are the 360° panoramas in which the user is able to explore the real estates in an interactive way. This is a whole new way of infotainment.